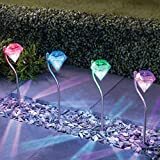 Set of 6 solar powered colour changing diamond stake lights. These gorgeous solar stake lights are perfect for adding some sparkle to your garden or pathway. The integrated solar panels will charge the lights during the day, then come nightfall the LED’s will automatically illuminate.